First Tartar Missile Kill 1958 | Yorktown Aviator's Blog - "Call The Ball!" The first successful firing of a Tartar surface to air missile took place at the Naval Ordnance Test Station, China Lake, California on 19 August 1958 and it destroyed a target consisting of a F-6F drone. The birth of the Tartar, Terrier and Talos missiles began with Operation Bumblebee, a secret Navy program which took place on Topsail Island, North Carolina, during the postwar years 1946-1948. The first series Tartar missile, RIM-24A, fired from the USS Norton Sound (Photo: Hank Morris, USS Norton Sound). 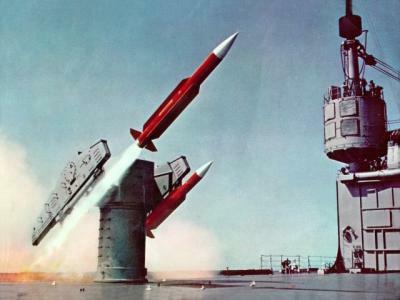 The Tartar missile program was designed to provide a medium range SAM (surface to air missile) for smaller ships that could not handle the size requirements of the Terrier missile. After initial testing General Dynamics began producing the basic Tartar (RIM-24A). About 600 were completed for use on Adams class DDG’s. The Improved Tartar incorporating a change from a mechanical scan to an electronic scan antenna, and other improvements was built between 1961 to 1963 (approx. 1,800 were built). About 2400 RIM-24 missiles of all versions were produced. 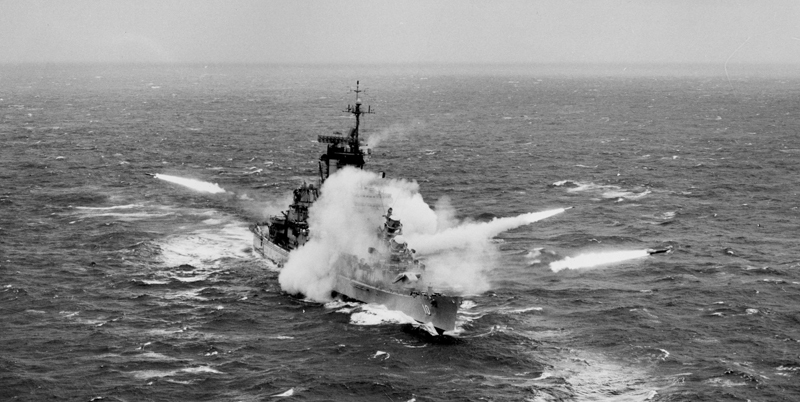 In U.S. Navy service, the Tartar was replaced by the RIM-66 Standard MR missile. Below is an old home movie of a Tartar missile shoot off of USS Cochrane DDG-21, a Charles Adams class destroyer. There is a caption error on the picture. The ALBANY and her two sisters had Talos and Tartar, not Terrier and Tartar. Thanks Brooks, I got the caption from the US Navy museum web site , so they also need a correction.